What a long list of surnames! Some sources say Permelia was the daughter of War of 1812 veteran Thomas James Key and Sarah "Sally" Jones Key, both of whom are buried in Holly Springs Cemetery in Dallas County, however this FindAGrave listing for Thomas Key does not list Permelia at all, nor does the page for Sarah (but they otherwise seems so extensive) so I think perhaps there is some confusion. This will need more research. I think what's going on is another KEY who is getting mixed up with this Permelia. Our Permelia (AKA Parmelia Emaline Key) was the daughter of Thomas B. Watts Key and Sara Jones. She was born on July 30, 1823 in Jasper County Georgia and died on November 22, 1892 in Dallas County Arkansas. Name variations: Parmelia Emiline Key, Permelia Emiline Key, Parmelia Emaline Key, Parmela Emiline Key, Emalive, etc. Permelia was married 6 or 7 times to the following men and had at least 10 children. Mount Olivet Cemetery in Dallas County. Marriage: 20 Nov 1851, Dallas County Arkansas. Samuel was born in 1805 (confirmed, he was age 45 in the Census of 1850) in Kershaw County SC died about 1853. Had a Mill called "Old Ratcliff's Place" near Willow in Dallas Co., Ark. Samuel Ratcliff was listed as a farmer in Census records. He was in Mississippi by 1840, and later settled near Willow, in Dallas County AR. Samuel Ratcliff is buried in the Old Pleasant Hill Cemetery, also known as the Amis or Ratcliff Cemetery, Manning, Dallas County AR. 3. James Ervine Dunnahoe (Middle name also sometimes seen as Irvin) Additional versions of name seen: James Irving Donoho. Name spelled Donaho in Shelby Co. Texas 1860 census. I. Rufus Thomas Jackson "Tom" Dunnahoe (1854-1940) Buried at Cypress Cemetery in Dallas County. In his will dated February 7, 1857 her father, Thomas Key indicated Parmelia was separated from her present husband and provided for her should she remain "separate and apart from her said husband [unfortunately her husband is not mentioned by name but her last name is shown as Donahoe] and in a state or Widowhood, or until her said heirs shall become of age so as to enable them to earn the means for a support education." The will refers to he a Parmelia E. Donahoe indicating she was married and separated (divorced) from Irvin Donahoe by February 7, 1857. Irvin Dunnahoe was born circa 1810. He married Parmelia Emily Key, daughter of Thomas J. 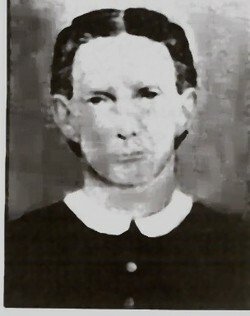 Key and Sarah R. "Sally" Jones, on May 20, 1854 at Dallas County, AR. [Date from a query posted on the Dallas County, AR website, March 15, 1998.]. 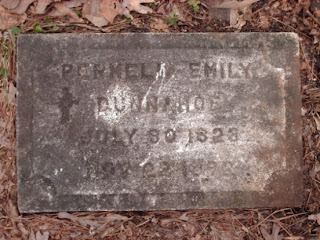 Irvin Dunnahoe and Parmelia Emily Key were divorced in 1857 at Dallas County, AR. 52 years old in the Shelby Co. Tex. 1860 census. Marriage: 01 Oct 1856, Dallas County Arkansas. I don't know why the difference in these photos. I think the one below is a "flipped" image of the image above. And where does the last name ROBERTSON come from, you may ask? Well I haven't found her spouse yet named ROBERTSON, but in the 1880 Census, she's shown as P.E. Robertson, age 55, living with Ann (Porter) and Lafayette Ratcliff in Arkansas. So there must be another marriage we're missing. We're a couple years off for her age, but everthing else seems to match, and the Census takers for this family were notoriously happy-guessers. The Census records her as a Widow who was born in Georgia and that both her parents were born in New York. The Census also shows Lafayette as P.E. 's son.